We have completed one of our most successful seasons in recent years, winning four local league tennis titles. 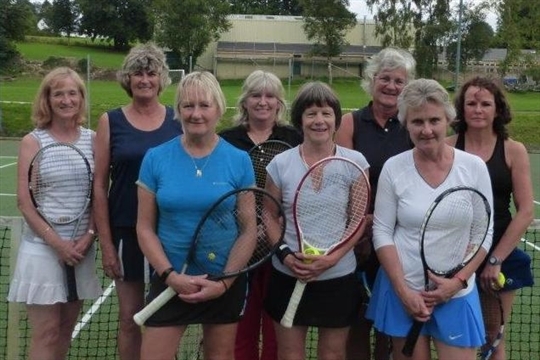 Heversham’s Mixed team also won the Division 1 title in a close fought battle with Slyne. In the last two years Slyne’s ability to field consistently strong teams has given them the edge. This season, however, Heversham were able to turn out their strongest teams against Slyne, winning both matches 10-2 and 11-1. These victories proved decisive and enabled Heversham to take the title by 11 points. In the Ladies league, Heversham’s path to the title was anything but straightforward. Going in to the final match of the season against Slyne, Heversham were trailing by 2 points and needed to defeat their rivals by a 3 point margin or more. The final scoreline 6-3, barely tells the story of a tense encounter. The key rubber proved to be between the team’s respective first couples. At set-all, a champion’s tie break was needed to separate them, but it was Heversham’s Tessa Pemberton and Harriet Glaves who came through 10-3 to set the team on its way to a first league title in three years. Heversham’s Ladies also gained success winning the first division title in the Lancaster and Morecambe League for the third year running, thus ensuring a grand slam of Senior titles for the club. Earlier in the summer, Heversham’s Junior teams had blazed a trail in the Aegon County Leagues. Titles were won by the Under 9s, captained by Paul McLaughlin, Under 12s, captained by Bruce Grime, Under 16s and Under 18s, captained by Jon Griffin and the Open Age team captained by Max Shaw.